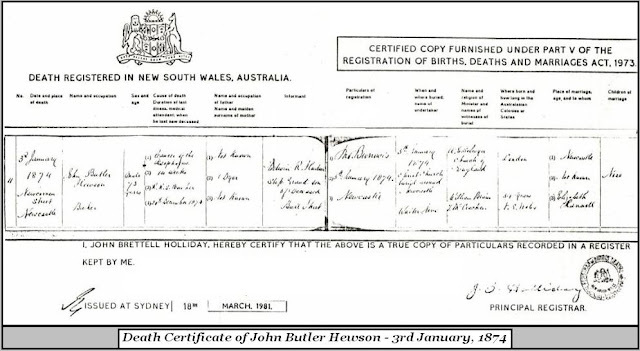 A sincerely nice guy, from all information at hand, JOHN BUTLER HEWSON, was born on the 12th Jan. 1800, in England. 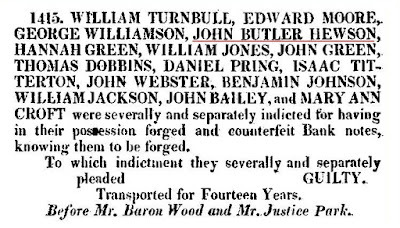 On the 27th Oct. 1819, Hewson was indicted, and summarily found guilty of Royal Offences: Coining. 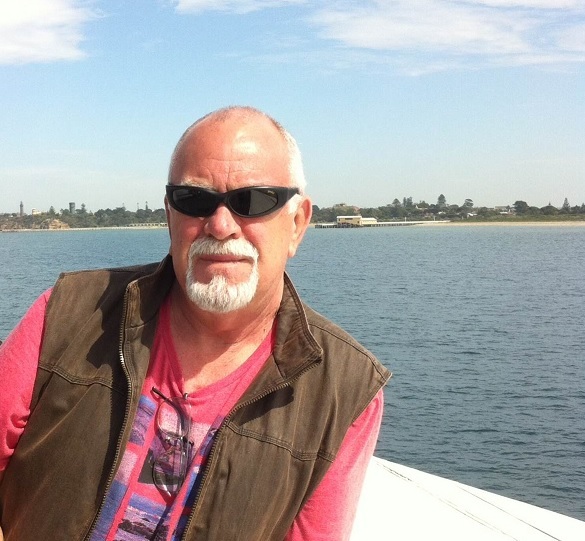 He was transported to Australia, for 14 years. The trial at the Old Bailey ref# t18191027-37. He arrived in Australia aboard 'Mangles', on the 7th Aug,, 1820. 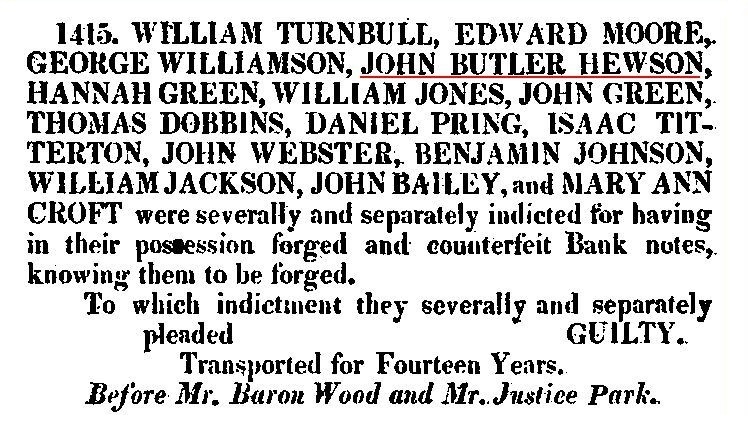 In 1827, at the pleasure of his Excellency, the Governor, John Butler Hewson, a 'Ticket-of-Leave' man, was appointed to replace Thomas Bishop, as Police Constable in Newcastle. The latter being dismissed for drunkenness. It was at this time, that Hewson met Elizabeth Hannell. He eventually, became foster-father to Elizabeth's four children. From all accounts, J.B. Hewson was an extremely likeable and warm-hearted fellow. The following is an excerpt from a book, entitled; "How to trace your Convict Ancestors", by Janet Reakes. 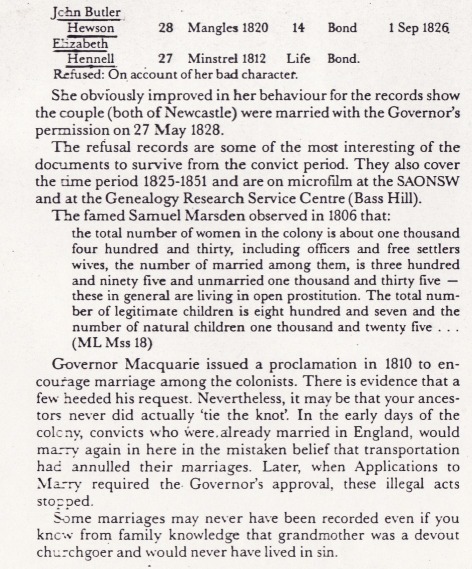 Hannell's character was assessed as 'very bad', and it required a special allowance by the Governor, - for marriage only - before they could actually wed. Application to marry was submitted in 1826 and Banns were read on 28th May, 1828, at Christ Church. They had no children from this marriage. From 1832-35, Hewson was Gaoler, in Newcastle. Elizabeth was appointed as 'Matron of the Gaol', on 28th Jan, 1833. Hewson resigned and then took over the lease on the 'Union Inn', which was situated on the corner, of what is now known, as Hunter and Bolton Sts, Newcastle. He remained there for another five, or so, years, until 22nd June, 1840, when he transferred the lease and Licence, to ROBERT TIGHE. In May, 1841, Hewson was granted the Licence for the 'Rose and Crown' hotel, in York St, Sydney, but the licence had to be transferred to a person named Cooper, as Hewson was likely to become insolvent. This happened, unfortunately, the following year, and, as reported in 'The Australian', on 30th June, 1842, Hewson surrendered his estate to Bankruptcy. The 'licence' for the 'old' Union Inn was transferred from Sarah Tighe, Robert's widow, to one William Latham. He, too, met with insolvency, in 1846. Hewson tried again, in 1846, when he was granted the Licence for the ''Wool Pack Inn'. He also purchased some land in Lane St, Newcastle, and after somehow re-gaining the licence for the 'old' Union Inn, built the new 'Union Inn', in 1853. It is thought that James Hannell, Hewson's stepson-in-law, a very successful Publican in his own right, was associated with this venture. In 1855, the lease was advertised on the 'Union Inn', as John and Elizabeth planned to retire. 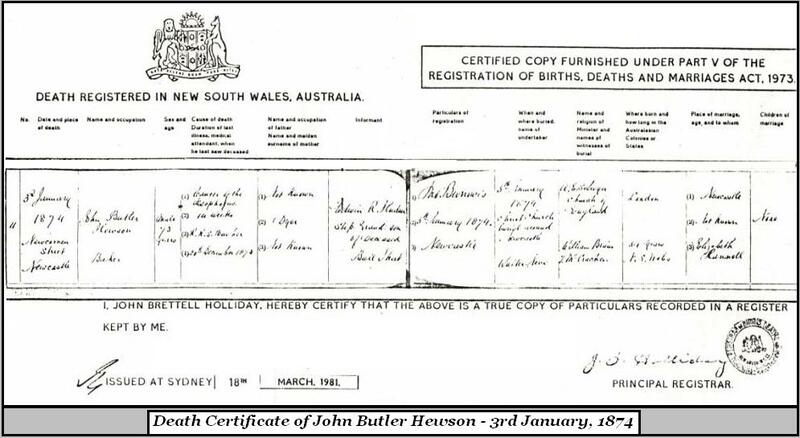 Despite his convict background, John Butler Hewson was, by all accounts, a loving, gentle and earnest man. He accepted his lot, and in some cases, that of others, without problem. 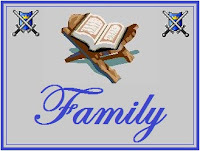 He raised some of Elizabeth's children, mainly Mary Ann, and was much loved by her. Hewson died on the 3rd January, 1874, closely followed by Elizabeth, on the 1st May, 1874. They are both buried at the Christ Church cemetery, in Newcastle.